Cider Vinegar vs. Apple Cider Vinegar: What Makes Them Different? Home > Food Facts > Cider Vinegar vs. Apple Cider Vinegar: What Makes Them Different? Apple cider vinegar and cider vinegar have been used for medicinal purposes, beauty and skincare, as well as cooking and cleaning. They are used in salad dressings, vinaigrette dressings, marinade, and as a food preservative. But is cider vinegar the same as apple cider vinegar (ACV)? What are the cider vinegar vs. apple cider vinegar differences? Apple cider vinegar and cider vinegar are almost the same. ACV, as the name suggests, is made from apples. ACV has a pale to medium amber color. Cider vinegar is also usually made from apples. But, it can also be made from other fruits such as raspberries and is called raspberry cider vinegar. So, apple cider vinegar is also cider vinegar. The reverse may or may not be true. Cider vinegar comes from fermented fruits such as apples or raspberries using a substance called “mother of vinegar.” It contains bacteria which breaks down the sugar in the fruit juice to malic and acetic acid, which results in sour-flavored vinegar. ACV and cider vinegar can either be organic or non-organic. Non-organic vinegar is a pasteurized, clear amber liquid. The organic vinegar looks congealed and has a cloudy appearance. Let’s see the difference between cider vinegar and apple cider vinegar based on three varying factors. The processing of cider vinegar and ACV is the same. The juice from fresh apple is extracted to make ACV. For cider vinegar, the juices of respective fruits are used. Bacteria and yeast are added to the juice to convert it into alcohol. It breaks down the fructose, a naturally occurring fruit sugar in the juice, to malic and acetic acid. The alcohol then goes through the fermentation process again by adding more bacteria. The longer the bacteria remains in the container, the more acidic the vinegar becomes. ACV and cider vinegar both have a high acidity. Consuming the vinegar in large quantities may also burn your throat. They are often used in salad dressings and marinades due to their high acidity and tart taste. Apple cider vinegar or any other cider vinegar is acidic and has a slightly fruity flavor, but the taste is sour. You should consume ACV in a diluted form. Simply can add ACV to a glass of water and add a sweetener of your choice. The flavor decreases as the vinegar is heated. Cold vinegar tastes stronger than heated. Cider vinegar has the essence of the fruit used to make it. Apple cider vinegar can be used in dressings, sauces, tea, and, juices. It gives a fruity punch to any dish. While making any recipe that calls for apple cider vinegar, you can substitute it with another vinegar or similar ingredients if you don’t have any on hand. You should use a substitute equivalent to the flavors of ACV, as some vinegar is acidic while others are mild. Here are eight substitutes for apple cider vinegar. You can substitute one tablespoon of ACV with one tablespoon of lemon juice, two tablespoons of white wine, or one tablespoon of lime juice. One teaspoon of apple juice for every quarter cup of white wine, rice wine, or champagne vinegar. Half a cup of red wine vinegar, a quarter cup of water, and one teaspoon of sugar. One teaspoon of honey and a quarter cup of white distilled vinegar. Passion fruit vinegar is a good substitute to ACV. It contains only the raw fruit and no sugar. Passion fruit has good amounts of vitamin C and fiber. This vinegar goes well with seafood. Strawberry basil vinegar is tart and full of antioxidants. Fruit vinegar slows the sugar absorption rate in the bloodstream and is a good option for people with diabetes. Coconut vinegar is not as commonly known as cider vinegar. It has fewer calories than ACV and is very tart. It comes from the sap of coconut palms. Lemon thyme vinegar includes the benefits of lemon and thyme. Thyme contains iron and polyphenols while lemon adds tartness to drinks. ACV is touted to offer numerous benefits for your health, skin, and more. It regulates the digestion process, relieves acidity and heartburn, and it may also aid in weight loss. You can have a spoonful of ACV in water every day in the morning. Or, you can apply it topically to get rid of various skin issues such as scars and blemishes, sunburn, as well as insect bites. ACV is also useful for many household purposes such as cleaning, removing odors in a room or an area, and more. As far as ACV is concerned, opt for organic ACV rather than the non-organic or processed varieties. The reason is due to the processing that non-organic ACV undergoes such as heating and distillation. Although non-organic ACV may appear clear, it loses the good bacteria, enzymes, and other nutrients in this process. These are essential and are in abundance in organic ACV. 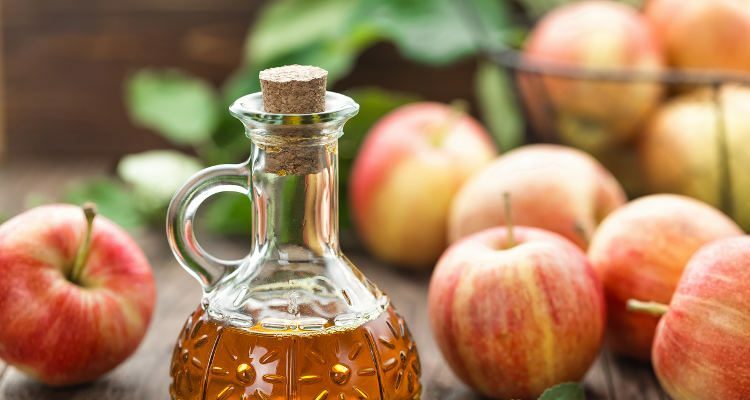 Now that you know the cider vinegar vs. apple cider vinegar difference, you can use them in your cooking and everyday life to reap all the health benefits they have to offer. They differ slightly in taste depending on the source used, but their benefits are almost equal. Huffstetler, E., “What to Substitute for Any Kind of Vinegar,” The Balance, August 4, 2016; https://www.thebalance.com/vinegar-substitutes-4048794. Guth, D., “Six Healthy Alternatives to Apple Cider Vinegar,” Boston Magazine, November 11, 2015; http://www.bostonmagazine.com/health/blog/2015/11/11/healthy-vinegars/.